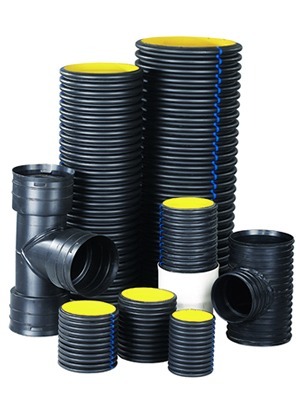 HDPE Corrugated Pipes are used in sewerage projects in industrial waste transport, drain water, storm water drainages, french drain lines, sewage lines, drilling projects, culvert hdpe pipe lines, underground canalisation projects and in transport of the drainage waters. HDPE Corrugated Double Wall Pipes are produced as SN 2, SN 4, SN 6 and SN 8 as their corrugated pipe diameter table. Corrugated Pipes outer surface of the corrugated culvert and the smooth inner surface of the double-walled and because produced from HDPE have high resistance against corrosion. Uses of the HDPE Corrugated Double Wall Pipes, French drain drainage projects produces as Perforated Corrugated Pipe and Corrugated Pipe. Use of Corrugated pipe minimum life of 50 years and when used in accordance with the SN value culvert pipe of the project and can be use more years accurate by using appropriate methods. Double Wall Corrugated Pipes used in sewerage projects, industrial waste transportation, storm water drainage and drainage waters transportation project. Corrugated Pipe thanks to its flexible structure demonstrate compliance with the underground motion safely usable in French drain systems on drainage pipelines. Corrugated Pipes provide many years of trouble-free operation in infrastructure projects culvert pipe type. Corrugated pipes ensures a longer life of the filling being laid solid ground. Corrugated Pipes have superior corrosion resistance, provide ease transportation because of lightness. By combining the floor seals are completed quickly. Due to the sealing properties do not spread sewage into the groundwater. Corrugated Pipes are usually produced in 6 m lengths. -Hdpe double wall corrugated pipes uses in drainage projects, french drain lines, drain of storm water. -Corrugated pipes uses as perforated pipe culvert pipes – slotted pipe in the waste water discharge pipeline projects and storm water discharge projects. Also we are manufacturing HDPE corrugated pipes up to 2200 mm.